Browser allows to view spectra, advance one spectrum at a time or to go quickly through a range of spectra. The spectra can be stacked or averaged to reduce statistical noise. Peak identification tools include Compton continuum removal, identification of individual peak positions and scatter-plot of peak positions for the selected range of spectra. 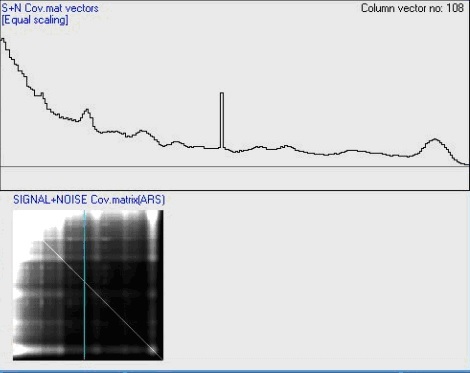 Residual spectra can be displayed to assess the quality of input spectra approximation by model responses or by principal components. Channel/energy cursor is linked with a nuclide library for quick and easy reference. The nuclide library can be easily updated and extended by the user. Window processing includes all standard processing steps: background removal, stripping, live-time, altitude, and sensitivity corrections. The user is required to enter correct experimental calibration constants for the actual project using a dedicated program dialog. Implementation follows industry standards as proposed by IAEA . Full-spectrum processing is the most significant feature of the Praga4 software. This function was designed specially for the processing of man-made (artificial) radiation data. Full-Spectrum processing uses a weighted least-squares fitting algorithm to find contributions of individual radionuclides into the input spectra. Praga4 has also implemented a technique using model detector responses derived by the Monte Carlo photon transport simulation code. The current version of Praga4 software is supplied with new model responses which have been specially adjusted to allow for the contribution of secondary radiation, and for peak resolution to fit the characteristics of the real spectrometer system. Using new set of detector responses, Praga4 is now able to process spectrum information from 0.2 to 3.0 MeV. Up to 12 nuclides at once can used for fitting to deliver results in activity/concentration and exposure/dose rates. Praga 4’s full-spectrum technique includes a complete system of spectrum background removal. Aircraft, cosmic, and radon background components can be separately adjusted by the user via control of experimental calibration constants. Principal component (NASVD and MNF) analysis tools allow us to investigate spectrum signatures included in the actual dataset. A spectrum dataset is converted into a limited set of spectrum components (eigenvectors) which are ordered by variance (NASVD) or by signal to noise ratio (MNF). 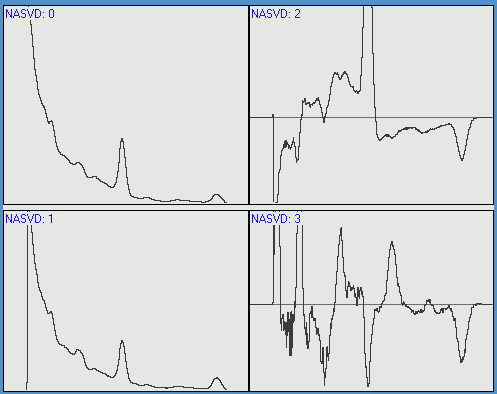 NASVD expects noise to be Poisson distributed, while MNF computes noise model directly from the data. Higher order components can be explained as mixed nuclide responses collected at average survey altitude. They are followed by components that account for the altitude changes and remaining components contain statistical and instrumental noise. Principal components can be used for gamma-ray data processing. The approach is very similar to the spectrum fitting technique. However, instead of model responses, a subset of spectrum components, derived directly from the data, is used to replace the input spectrum. Using Praga4, an “eigenvalue plot” can be displayed, allowing the user to browse through the individual components (eigenvectors) to investigate their shape. Covariance matrices can be displayed as well. Spectra can be interactively composed from the chosen number of components and compared with input spectra or alternatively, residual spectra can be displayed. In a situation where the user chooses to re-process data with another subset of components, there is no need to compute the eigenvectors again. Radon removal (not applicable for Praga4G – ground surveys) has a choice to use the window based, ‘spectral-ratio’ method that compares countrates of low and high-energy uranium peaks or the method that uses full spectrum difference in responses of the radon and ground uranium sources. Window based ‘spectral-ratio’ method has the option to use low-energy 214Pb (0.352 MeV) photopeak instead of commonly used 214Bi (0.609 MeV) photopeak. This approach is beneficial in areas with substantial 137Cs fall-out (Northern hemisphere) or for data with extreme Th/U ratio. Data import supports native Pico Envirotec (PEI) format, ASCII delimited files, or fixed size record format where data fields can be binary, ASCII or combination of both. Data records are defined interactively using Import Wizard. Radiometric spectra can be either 256 or 512 channel with arbitrary channel width. Praga3 includes spectrum stretching algorithm using 2nd order polynomial fit. Interactive mode. Praga4 is a GUI oriented software suite that enables analysis and interactive control over the dataset prior to starting the final processing. 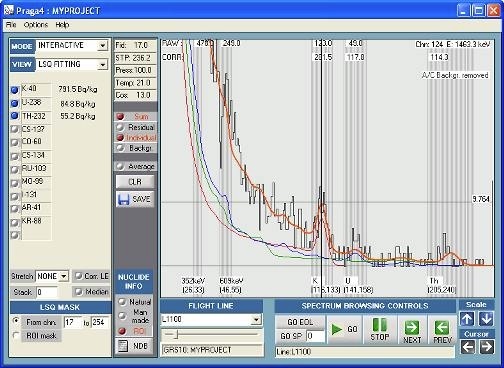 Using the spectrum browser, spectra can be investigated on a spectrum-by-spectrum basis allowing the user to assess the proper function of spectrum-fitting or principal component process. Displayed spectra can be saved in an ASCII file. Processing mode. Actual processing is done using a special processing mode where the spectrum display is disabled to speed-up processing tasks. All tasks needed for a given project – including standard window, full-spectrum fitting, principal component analysis and processing can be done within single processing run. Data output has range of options including a choice of relative (window count rate) or absolute (activity, exposure and dose rates) units for all, window, spectrum-fitting and principal component/window techniques. In addition, results can be multiplied and offset by user defined constants if required.